CIC is a Taiwan company manufacturing electronic DIY kits. These kits are designed to help children acquire and improve robotic engineering skills, to introduce alternative energy sources and their working principles, to educate about space stations and give a chance to learn while playing. CIC robot construction kits have already become quite popular among children and adults all over the world, so it’s no big surprise there are many Chinese counterfeits on the market. We are here to elaborate on all specific features original CIC products possess and point out a few significant points that will help you choose a high-quality toy for your kids. We would like to focus on two kits in particular: Solar Rechargeable Space Fleet 7 in 1 and Educational Solar Robot Kit 14 in 1. Original CIC toys are made in Taiwan. They are best known for their high quality; these toys are made of environmentally sound and non-toxic materials (plastic and metal). Every CIC toy has been environmentally tested and certified for use worldwide. CIC kits are transformers, which is their key feature. In other words, when you buy one toy you actually get three, four, or even fourteen different toy options. For instance, you can assemble seven models with the Space Fleet construction kit: a space mech, a station, a rover, an explorer, an astronaut, a dog, and a shuttle. In addition, CIC construction kits have different sources of power supply: batteries, saltwater energy, hydraulic and hybrid power systems, and also solar energy (e.g., Solar Robot 14 in 1). However, when it comes to Chinese counterfeits, the repair of their components and the overall toy operation may be disappointing. The thing is that the plastic itself and its manufacturing process are of much lower quality, which adversely affects both the assembly process (it’s hard to cut the parts, and they are connected loosely) and the operation of moving parts. With solar panels, the situation is similar: they may either not work at all, or be too weak. While choosing CIC construction kits, you should carefully examine the package appearance and its contents. In particular, CIC boxes have product information in English and every small part is stored in a separate sealed bag. There also may be a multi-colored information tape with the description of a toy. A strong smell, glaring colors of the box and plastic itself, poor-quality mounts should alert you and get you thinking whether the chosen toy is actually safe. The place where you buy toys also matters. When you buy a CIC construction kit from a suspicious vendor, you and your kid may end up having a spoiled day at the least, or you can even put your child’s health at risk. Be sure to ask the seller for documents (certificates) confirming the toys’ quality and their country of origin. Sure, the price is also a good criterion when buying a toy. A low cost of a toy should definitely raise your doubts. Original products are made in compliance with all quality standards, so they just can’t be cheap. On our site, you can always find the up-to-date prices on CIC construction kits. parts, especially small parts, stored in separate packages - sealed bags. 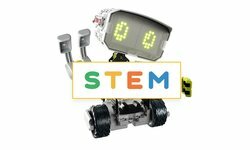 In the toys4brain store, you will always find a complete range of CIC construction robot kits. Check out for yourself! Contact us to get more information about toys you are interested in.